Barneveld was born when David Simpson offered the railroad right-of-way through his farm for $1 if it would build a depot there. He subdivided and began selling lots. It originally was called Simpsonville. 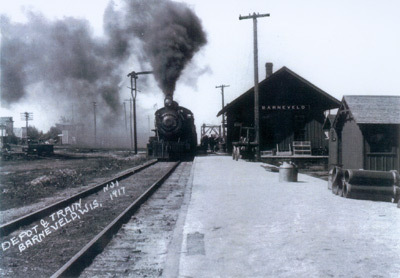 The origin of Barneveld’s name is unclear; however, some believe the name was chosen by a railroad surveyor, Mr. Orbison, who was from the Netherlands. Most of the early settlers were from the British Isles. County highways K and HH lead north out of Barneveld along Hogback Ridge, which was used by soldiers during the Blackhawk War to get to the Wisconsin River. For many years, this route was an important link between the lead region and the railroad that went along the Wisconsin River. At the onset of the Blackhawk War, area miners and settlers who became part of Col. Henry Dodge’s militia built a fort (southwest of the present intersection of Highway 18/151 and County F) to protect the area’s lead miners. The Army used “the ridge” as a route to the Wisconsin and Mississippi Rivers. The fort had four block houses ten feet high, with two walls that jutted out so Indians couldn’t climb them. It was garrisoned by Colonel Henry Dodge’s Iowa-Michigan Brigade from May 20 to September 20, 1832. Blue Mounds Fort also served as a stopover for travelers. The first Norwegian settlers came in 1846. Their houses were small and simple. Many settlers dug out the sides of a hill and set posts to form a front wall in which they made a door and one or two windows. Pulitzer prize-winner Hamlin Garland found characters in Blue Mounds for many of his novels.